The Russian-built nuclear plant will become fully operational in the next two months, KNPP’ s site director said this week. The commercial operations of the first unit of the Kudankulam Nuclear Power Plant (KNPP) will begin only by the end of the year, R S Sundar, the plant’s site director told the Business Standard. The 1000-MW unit would become fully operational in less than two months, Sundar told the paper. The plant was producing 680 MW, at the moment, according to the report. “We have applied for approvals from the Atomic Energy Regulatory Board to increase it to 90 percent and then to 100 percent,” Sundar told the paper, adding that power would be sold at Rs 3.50 a KW. “The plant generated 1,136 million units. The unit was synchronised on October 22,”Sundar was cited by the paper as saying. 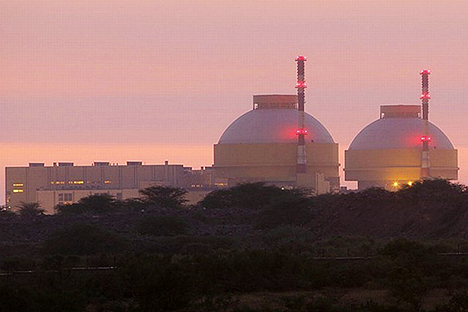 With the unit going live, nuclear power production in India would increase to 5,780 MW, according to the report. India and Russia have finalized all the formalities for the third and fourth units at Kudankulam, which will come under India’s civil nuclear liability law for suppliers. The Indian Election Commission gave a green light for a deal to be signed and clarified that a signing during election season would not violate the model election code. A deal is expected to be signed soon.